MBI (Military Ballistics Industries) is a remanufacturer of pistol ammunition based in the USA that has a great reputation for providing quality ammunition that rival new ammunition in quality, at a reduced price point generally. 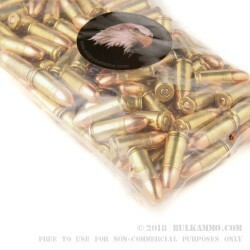 This is a 100 round pack of 9mm Luger ammunition that is packaged in a plastic bag with loose ammunition. The 115 grain projectile is a full metal jacket in the typical conical bullet profile, and MBI states that the components that make up the balance of the round are all premium quality. MBI doesn’t take that statement lightly, they actually use very high-quality components in their remanufacturing efforts, including: Hodgdon, CCI, Hornady, Winchester and others at that level. That’s a very nice supply chain for a remanufacturer. 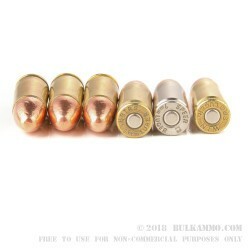 The price is low, usually about 2/3’s or so of the cost of low priced new ammunition if bought from BulkAmmo, so if you go by the positive reviews that MBI receives online, you will be making a dent in your high cost of ammunition. This is a suitable round for use in range shooting, basic target use and for plinking. It is reloadable for the most part, as they claim to reload only once fired brass, but it may be worth your while to sell-on the cases, unless you want to take on the process of extensive resizing that may be necessary to re-use the rounds. Ran great through a glock 19... But what doesn't? Got mine in about 4 days, But I live at the end of the road in Texas.... Ordered 300 rounds and we shot half in one afternoon with a Ruger SR9C and a KelTec P11. Great ammo! inexpensive had no problems at wll with 100 rounds through my beretta 92.. then again my beretta never jams!!! 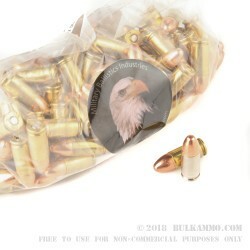 i would def recommend this ammo over any other ammo on the market. it was accurate, clean and inexpensive what the hec else do you want from ammo. i will always buy this MBI ammo because so far i am highly impressed with the results..
Review by zeake62 in Pa.
Q: Are the rounds magnetic? A: Hello Jackson, These 115gr. 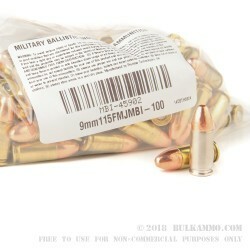 FMJ rounds by MBI in 9mm have a lead core, copper jacket, and brass case. They are non-magnetic and are safe to shoot on ranges that do not allow magnetic rounds.